Disclosure: I recieved this product as part of an advertorial through Tomoson.com for Blog POP! School Rules. Regardless, all opinions are genuine and all photos are copyright Momma Told Me Blog 2014. Momma Told Me: Dessert doesn't have to be cake and cookies. Growing up packaged sweets were most often a treat reserved for holidays or 'Dad and Daughter time.' As a disabled stay at home mother, Momma knew all too well that keeping candy bars and pastries on hand most often meant lazy over-consumption. That is to say, if they were in the house, they would get eaten. However, living in Southern California had the benefit of living a short drive away from major family farms, where we would journey several times each Summer to pick our own fruit. We'd spend hours out in the fields and orchards and return with pounds of fresh fruit and produce. 90% of the fruit that made the trip home would then promptly make it's way to the sink, then freezer. And frozen was precisely how almost all of our bananas, berries, applies, and such were consumed. If I craved sugar in the afternoon Momma would pull out a bag of frozen grapes and I would snack to my heart's content. If I wanted dessert I would have my pick of raspberries, blackberries, and strawberries. Somehow enjoying these natural sweets frozen made the experience even more indulgent, and much more filling than when they were fresh. Before long we were cutting up fruit and freezing them in Popsicle molds, or tossing them in the blender with ginger-ale. 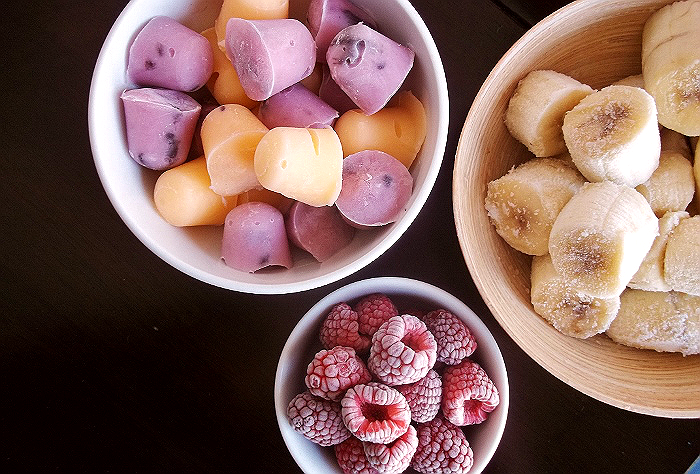 There was even a brief time where I forgot about traditional desserts entirely; so it's easy to see why I was so immediately excited about the concept of a new kitchen gadget that could turn my favorite frozen fruits into a soft dessert-like sorbet. 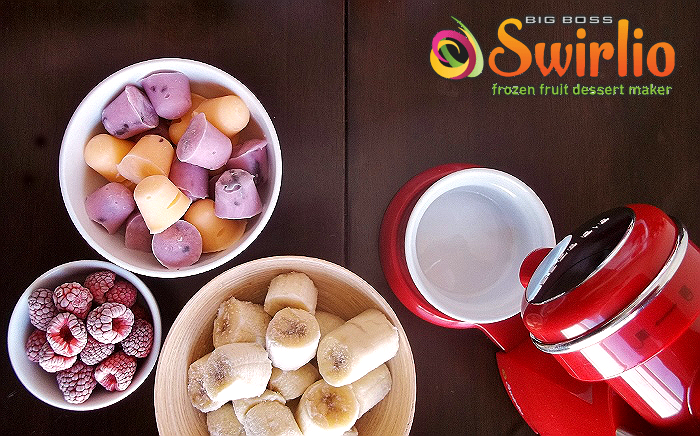 Available in 5 trendy color finishes, the Swirlio frozen fruit dessert maker, by Big Boss, is the must have kitchen appliance for anyone looking to treat healthier or simply reinvent their favorite fruits. As a household that has spent well over $150 on frozen yogurt specialty shops in a single month (in the heat of our obsession with the fad), we welcomed this more affordable and custom at-home dessert experience. 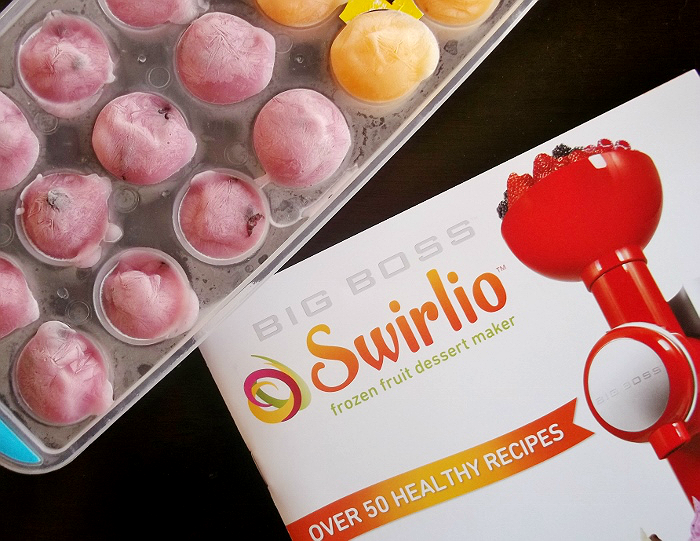 Ready to operate out of the box, the Swirlio essentially blends and dispenses slightly thawed frozen fruits to create a creamy and seamless frozen dessert. While the combination possibilities are endless, there is a generously sized, photo inclusive, recipe book included with each unit. The Swirlio advertises itself as having 'quiet operation,' which might be true considering what it does, with less solidified fruits- however, using the suggested 'thaw' time for our base fruits, the machine can make a substantial grinding noise. I'd place the noise level just below an average blender, bearing in mind that more frozen pieces, and small chips (nuts/chocolate) will put more strain on the grinding motor and result in more noise. It's also good to note that the Swirlio is entirely bladeless, for relatively safe operation. A large percentage of the Swirlio recipes rely on bananas. 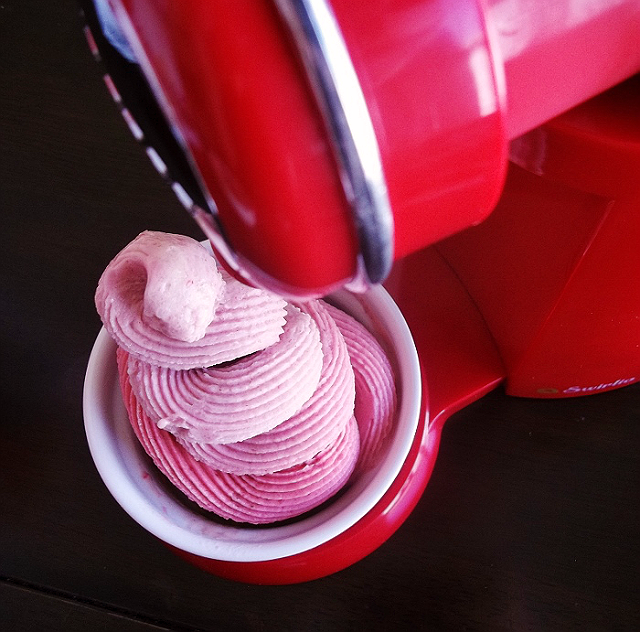 While bananas are not necessary to create desserts with the machine, it will yield a more natural 'faux' creamy texture that closely resembles frozen yogurt. Users are encouraged to forgo bananas for kiwi, pineapple, mango (etc) which will make a more icy sorbet mixture. 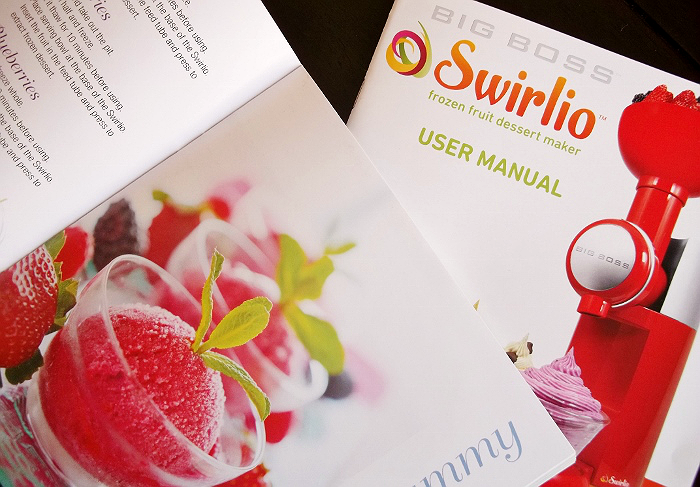 While I plan on using some of the recipes in the book, we were most excited to experiment and experience the Swirlio on our own the first few times. I immediately knew I wanted to freeze some different light yogurt varieties in our small ice cube trays, and also learned that peanut butter doesn't really freeze! We played with mixing frozen raspberries, yogurt drops, shredded coconut, bananas, peanut butter, and mini chocolate chips (not all at once!) 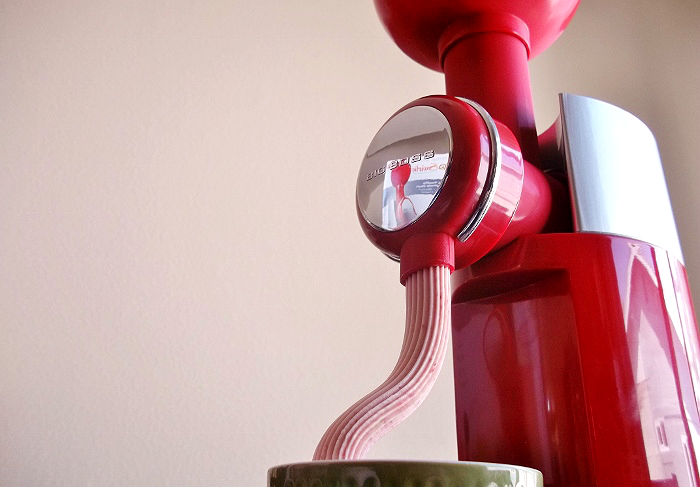 While the Swirlio book suggests users can add mini chocolate chips, the dispenser spout seemed to have trouble processing the ground bits, and had to be often cleared. Clean-up was as impressively easy as it was advertised. In all there were 5 parts that easily twisted and snapped off the unit for cleaning, as well as an optional bowl base. The grinding mechanism doesn't require any special installation or removal technique and all the parts cleaned with a good rinse following a soak. Peanut butter proved the most bothersome to clean, not surprisingly, and I was caught resorting to childish behavior 'scooping' the remaining mixture from the mixing cavity with my fingers, more than once. The unit was equally simple to reassemble, and I am happy to note the device matched our other kitchen appliances with it's pretty red finish! UPDATE: Big Boss sent us one of their brand new toppings dispensers for the Swirlio, which cleverly replaces the silver back-plate of the unit with a slide on topping station for up to 3 of your favorite add-ins. The Swirlio unit itself is currently available for just $60 (a significant drop from it's initial retail release price) and I believe the intention is to add the toppings dispenser into the initial value for a small bump in the future. 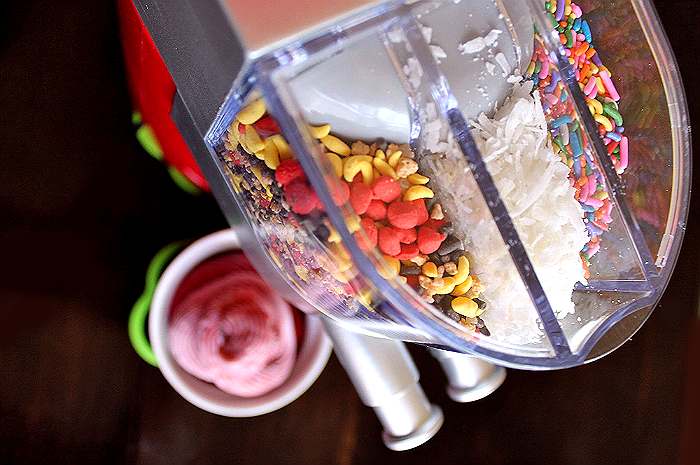 While the novelty of having toppings dispense at the push of a button was fun for our younger inhabitants, we had trouble with finer options (such as shredded coconut) that did not want to dispense easily. The harder options (nuts and sprinkles) dispensed freely and in goo portion, but will bounce and ricochet, so we learned to tilt the bowl and dispense the toppings along the inner rim for cleaner distribution. In all, I think the toppings dispenser is a nice addition to the unit, but not something I would keep set up for everyday use, it adds a lot to the overall profile of the unit (on my counter.) 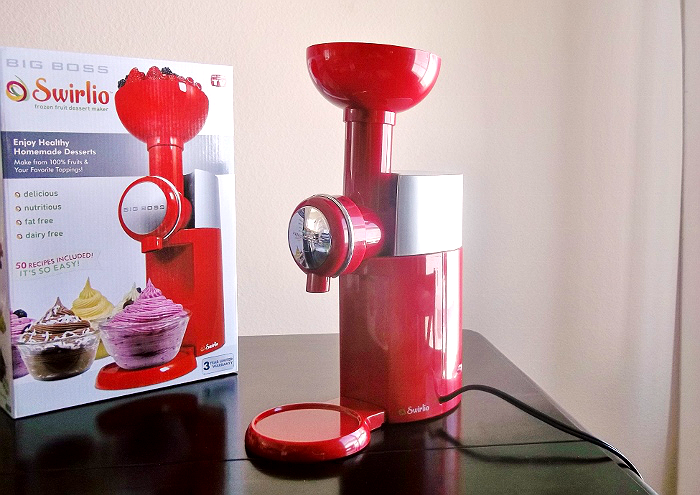 One of the things I love about the Swirlio, over my ice cream maker is the size of the unit itself, which I can keep readily available whenever I am in the mood for a frozen treat. That being said, for bigger families, and social gatherings, the toppings dispenser is pretty neat! What would you put in your Swirlio? 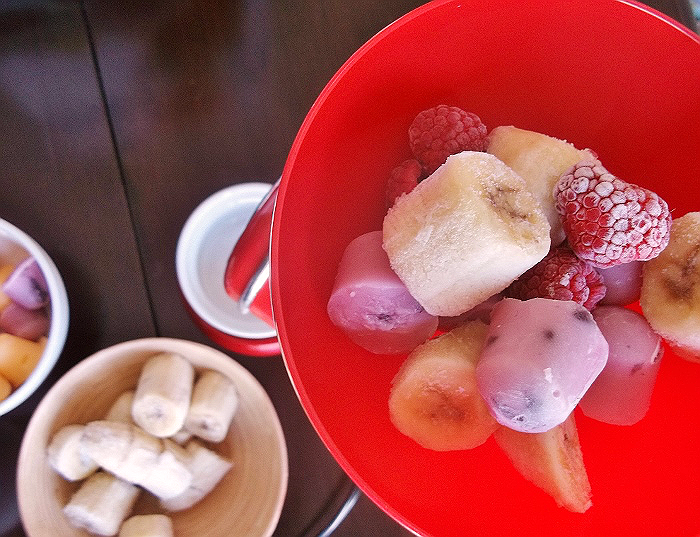 What Daughter Says: Take back dessert, enjoy frozen fruit desserts without the excess guilt. 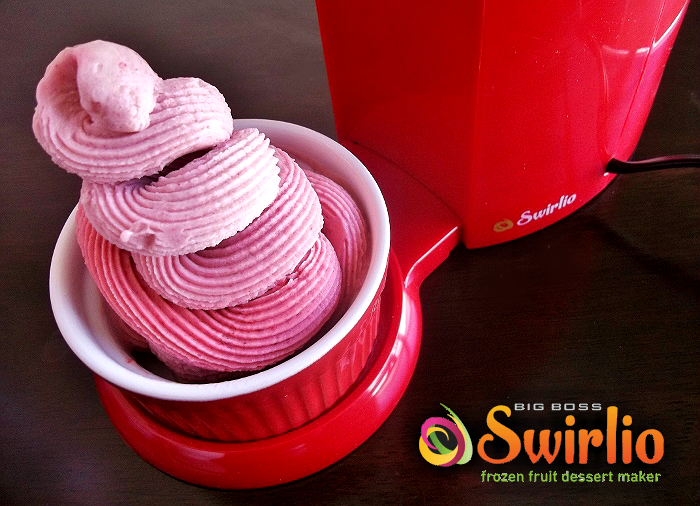 One Momma Told Me reader will win a Big Boss Swirlio machine in their color of choice with Toppings Dispenser! Available In 4 Colors - LOVE the Purple one!! 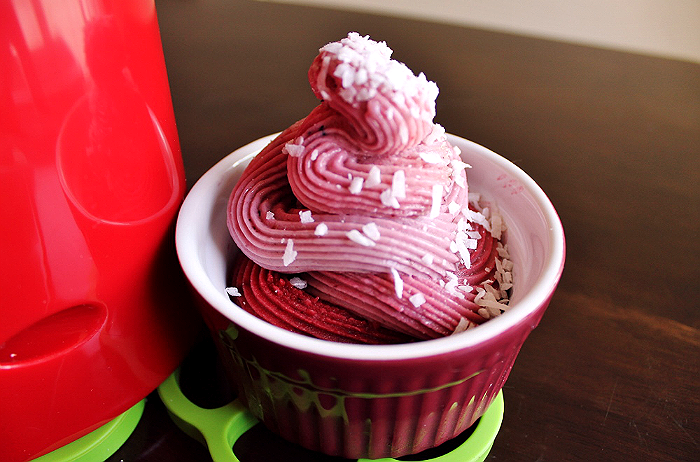 What a great way to make healthy frozen treats in the summer. We may have to look into this. It says it's safe for kids to use. That's good. Love the fact that there are no metal blades. The biggest feature for me is that it's dishwasher friendly. Wish everything could go in the dishwasher - makes life so much easier. I learned that it is available in four colors and it it safe for kids to use. I would love to try making some desserts with it. I learned that it is available in four colors and is safe for kids to use. My kids are watching over my shoulder and keep asking what is that?????? Can we have that????? 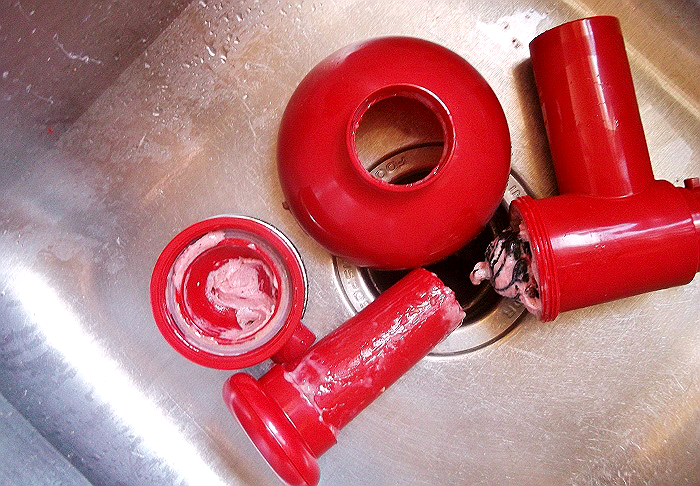 I learned that the Swirlio is safe to put in the dishwasher and comes in four colors. That is safe for the kids to use. This would be one gadget my husband would actually like! Super excited about this!! i learned that its dishwasher friendly. dishwasher friendly and I can use fruit for dessert. what a great idea. My mom would love this. She would be in heaven. I love the fact that it comes with a recipe book and serving dishes! I suffer from insomnia so I would love to try Night. Healthy and nutritious cold snack. Love that you can throw it in your dishwasher. I learned you can make Chocolate Hazelnut cream bu using chocolate hazelnut spread. I love that there are no metal blades so it's safe for my kids to help! Yum! I really like that this is dishwasher safe, and I'm loving the recipes on the site. The balsamic strawberry sounds amazing! i learned this isnt as dangerous as other kitchen appliances and there are no sharp blades attached! I learned that you can wash it in the dishwasher. I learned that its gluten free dessert. I learned that they have a 50 page recipe book and Swirlio was featured on Good Morning America! I learned there are no metal blades and it is dishwasher safe. I learned that it is safe for kids! Their recipes achieve some awesome-sounding flavors without actual ice cream! I love that is makes ice cream dairy free if you need it too! This is what my kids really want for Christmas I think! Dishwasher safe! A must! LOL Quiet, includes 4 serving dishes and a recipe book, dairy free! Great for vegans. Guilt free deserts! I really want one now. Thanks for the giveaway! I learned it's available in 4 different colors and has no metal blades. I learned that it's safe for kids to operate. I learned that it's available in four colors, one of which is purple! I love purple. I learned that it comes in colors: White, Red, Black, Purple and you can pay in 3 payments for it. I learned that it's quiet and dishwasher safe. I learned that it's safe for kids to use! I learned that you can make yummy desserts with no preservatives or processed sugars! I learned there are no metal blades (making it safe for children) and there are different color choices to select from. It has no metal blades and comes with a recipe book. I love that this is dishwasher safe for easy clean up! I learned that the Swirlio website offers some yummy recipes including chocolate Hazelnut Dream and Peach Melba Supreme just to name a few. I learned that it's dishwasher friendly!